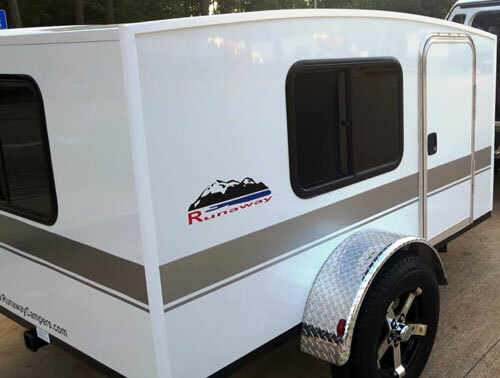 Runaway RangeRunner travel trailer is an inexpensive, “boxy”, roomy sleeping shelter for adventurers and an ideal entry level camper for DIY folks willing to make it their way…. 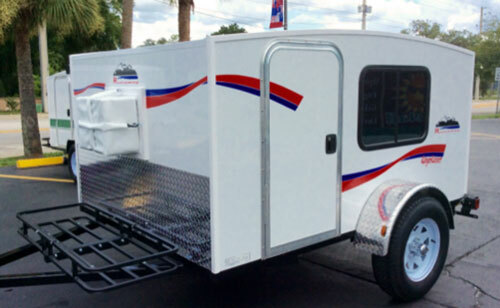 Runaway Campers is a family-owned company operating in Ocala FL. It all started in 2012 when Mr. Stephan Shives built his first camper in his garage. Then, after listing it on the Internet he noticed that the camper was literally “snatched” in split seconds… The rest is history, although quite unusual one. The owners (S. Shives and R. Lane) decided to make their campers affordable for almost everybody. Following this belief they designed Runaway campers using a “down-to earth” approach. In other words campers are equipped only with necessary features leaving the final “tune” to customers. In company words: “We focus on basics, not the bells and whistles”. To farther limit production costs, the company opted for direct selling bypassing expensive dealers’ network (this may be questionable for “remote” customers, given the fact that shipping fees will come out of their pockets, but certainly it is a great opportunity for these living closer to Florida). “We believe our business is a gift from God, how we handle it is our gift to Him” (and I would say to customers). 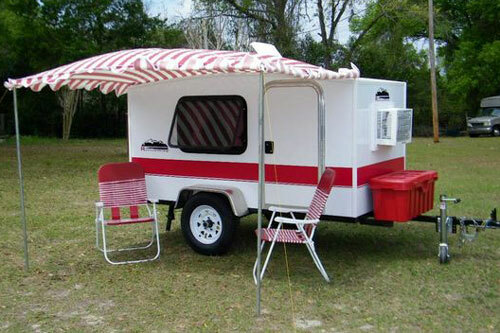 Runaway Campers offer the series of narrow-body models (4ft x 8ft) and one wide-body (6ft x 8ft). The first includes BaseCamp, CoolCamp and Navigator, while the second just one model – RangeRunner. The narrow models are ideal for towing behind small cars (dry weight of about 700 lbs and the width not exceeding that of the towing car). But definitely, their interior does not offer much room for individual “touch”. So for many, the answer will be the wide-body RangeRunner. But just to close this chapter – the narrow body models go for $2,500 to $3,500 (standard features make the difference), while the RangeRunned for under $5,000. Given their quality and features, they are surprisingly inexpensive (if not the least expensive) on the market. All mentioned models are factory-equipped with 5,000 BTU AC as a standard feature. In practice, the Runaway trailers are kind of Empty Boxes on wheels. Although it may sound uninteresting in reality the concept is very inspiring! They are designed as an entry level Utility Campers for those willing to give-up on their “Residential-style life” and embraces the nature, adventure and true camping experience. Contrary to modern trends, the shell is made from birch-plywood. Exterior walls are protected by aluminum with baked enamel finish. Interior is covered with carpet (walls and ceiling) and vinyl (floor). Large cabin (6’W x 8’L) offers a lot of space for sleeping arrangements and any solution – be it full/twin or queen-size mattress will still leave significant amount of free space for whatever you may need (fridge, storage etc…). The optional foam flip-sofa (46” x 72”) is just one of possible solutions. The cabin has two large windows and two doors (one on each side of the camper). Two doors definitely make easier access in and out of the cabin (just to make it clear – the cabin’s headroom is only 44”). 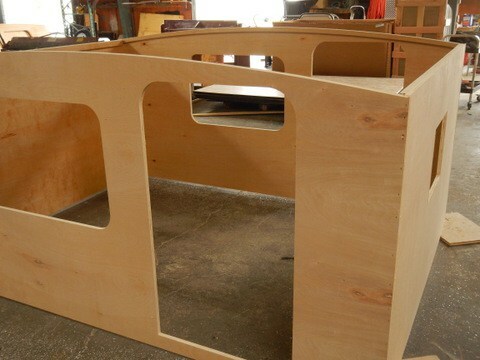 Optional rear door allows for setting-up a galley with the access from the outside. 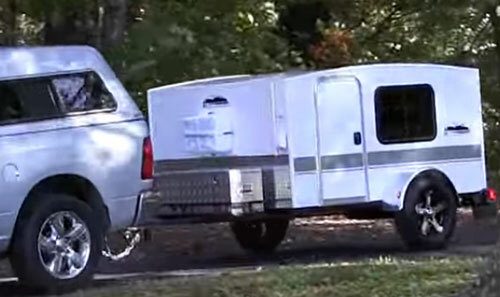 It also lets you to use the RangeRunner as a cargo trailer although this is not the primary goal, because “reaching out to Mother Nature” is what “Running Away” is all about (as the company name suggests)! The front-end storage box (standard feature) offers extra storage space. Optional extra shelves along interior front and real walls including cubby shelf should also help to organize “life” during get-away trips. Another useful option is the rear receiver - it can be used for a bike rack. Summarizing: the RangeRunner does not come with luxuries you may be accustomed to. 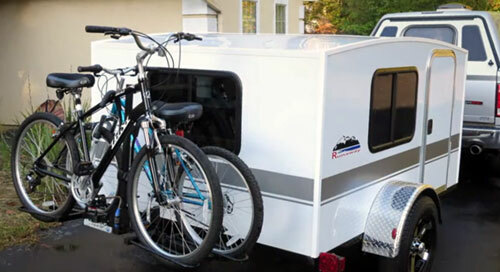 It is just what it is, an entry level, lightweight and very inexpensive “boxy” trailer offering protected sleeping area. But it also offers almost limitless opportunity to create your own “living environment” and by that – your own camping experience. It’s especially “blessing gift” for all DIY-kind of adventurers! It’s important to mention that these items are relatively inexpensive. Typically manufacturers try to make big bucks (literally $$$) on optional features assuming that customers will go for “painless” (read it – proven and ready to use) solutions. So here is a nice surprise – Runaway Campers stick to their policy of “giving back” and offer options at very decent price. And let’s be honest – unfortunately it is quite rare practice in today’s world so “chapeau” to Mr. Mr. S. Shives and R. Lane.